In today’s world, reading is basic to everyday life. As children we learn to read, and as adults, we read to learn. We read to learn about the news, to learn about rules, and to learn about how to do things. We also use reading to learn English. Reading is the best way to improve your vocabulary! The context of articles, stories, and conversations helps you figure out and understand the meaning of English words in the text that are new to you. Reading also provides repetition of vocabulary words you have already learned to help you remember them. Reading comprehension is easier if you already know the keywords in the reading. This is one reason that new vocabulary is presented and practiced at the beginning of each USA Learns unit. 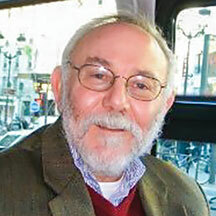 You learn the meaning and practice the pronunciation of the most important words that you will later read in video scripts and reading lessons. We say a picture is worth a thousand words. Pictures are an important aid to comprehension for students who are just beginning to learn English. In the 1st English Course reading activities, the sentences are short with some key vocabulary. The picture helps you with comprehension and to learn English words that might be new. You’ll hear the pronunciation of all the words on the screen when you click the Listen button. A good learning strategy is to listen to the speaker several times as you read along with the text. Did you understand what you read? 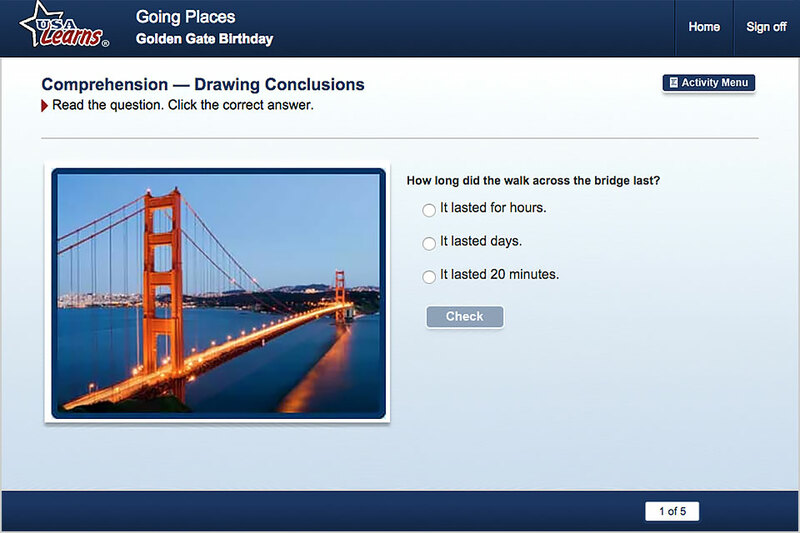 Check your understanding of main ideas and details in the comprehension activities. But, be careful! The answers are not always the exact words from the reading text. Reading comprehension requires vocabulary knowledge, background knowledge, and thinking skills. You’ll need to use these reading skills to find the answers to the USA Learns comprehension questions! In our intermediate courses, 2nd English Course and Practice English and Reading, the readings have longer and more complex sentences. You’ll find a variety of topics about the challenges and opportunities in our society, including education, workplace and community issues, health and safety and many more. You’ll learn and practice key vocabulary words before the reading activity. In the 2nd English Course you’ll learn background knowledge about the topic from the video story. These are important first steps to help you understand what you are reading. Read along with the text while you listen to a native speaker read it. Listen and read several times and you’ll be improving your pronunciation and listening skills too. Remember, read to learn English! 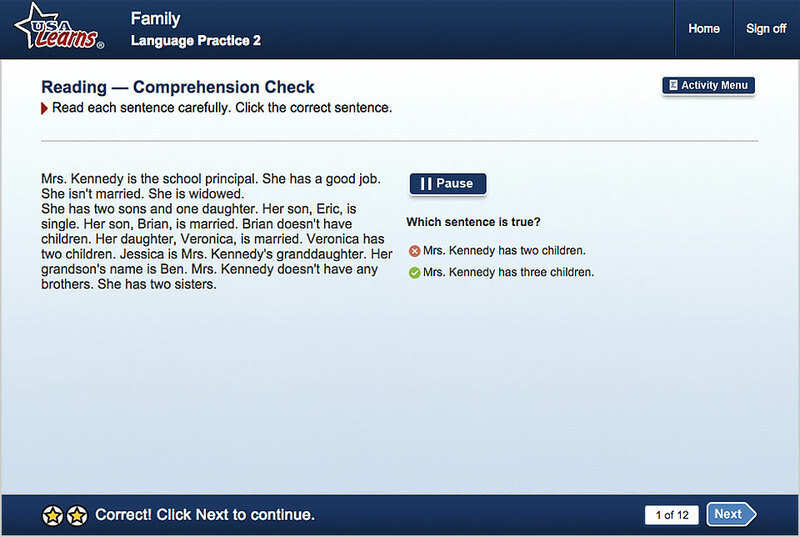 After reading and listening to the passage, test your understanding with the comprehension activities. 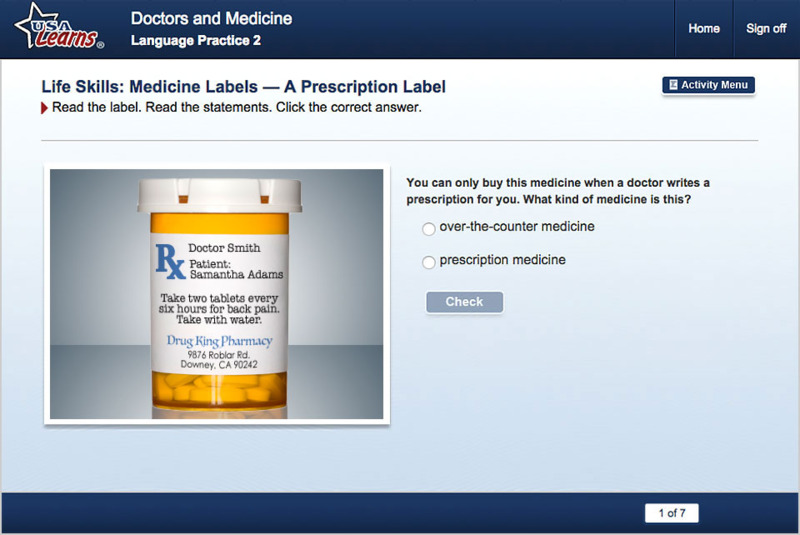 Because these are practice activities, the text will still be on the screen. But what if we take the text away? Can you still remember the main ideas? The text is no longer on the screen and you need to remember and think about what you read in Drawing Conclusions activities in the Practice English and Reading course. This is your chance to to show you know how to learn English with reading and thinking skills! There are many ways that reading helps you to learn English, but reading itself is an important life skill. In everyday life we use reading to get information about the world around us. There are signs on the street. Can you park your car here? Which days can you park? How long? There are letters from school or utility companies that come in the mail. There are also bus schedules, bills, medicine labels, ads, health care pamphlets, and technical manuals for our electronic devices. When you are new to a country, this is the first kind of reading you need. 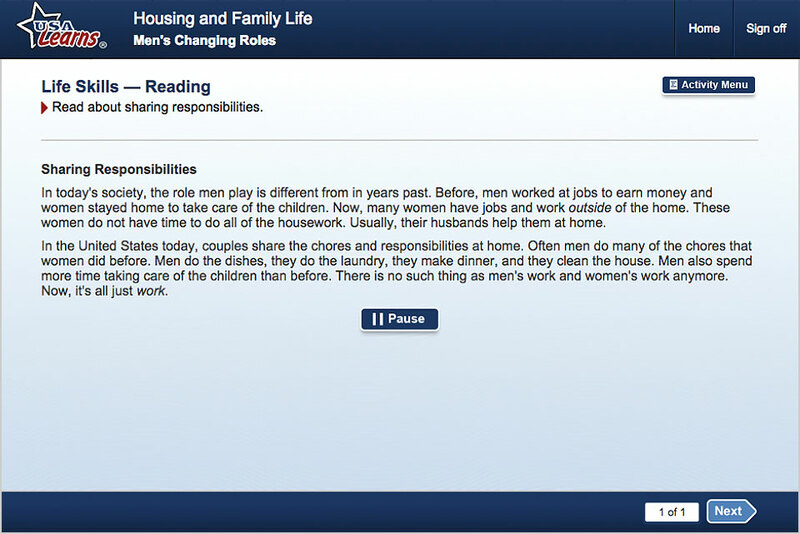 USA Learns will help prepare you with the Life Skills reading activities. Viktor and Karina learned that reading skills are very important when signing an agreement to rent an apartment in one of our 2nd English Course video stories. This is a funny story, but in real life, it’s not funny when you don’t understand what you have to sign. 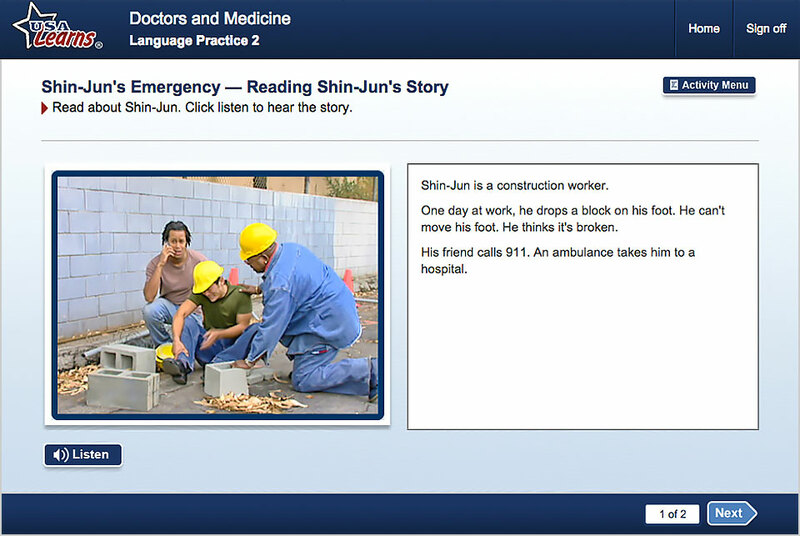 A good way to use reading to learn English listening skills is with the video stories in USA Learns. Everyone loves our interesting and funny stories about different characters living in the US, but understanding them is often a challenge. To reach your goal of understanding the spoken language in the videos, you can use reading. 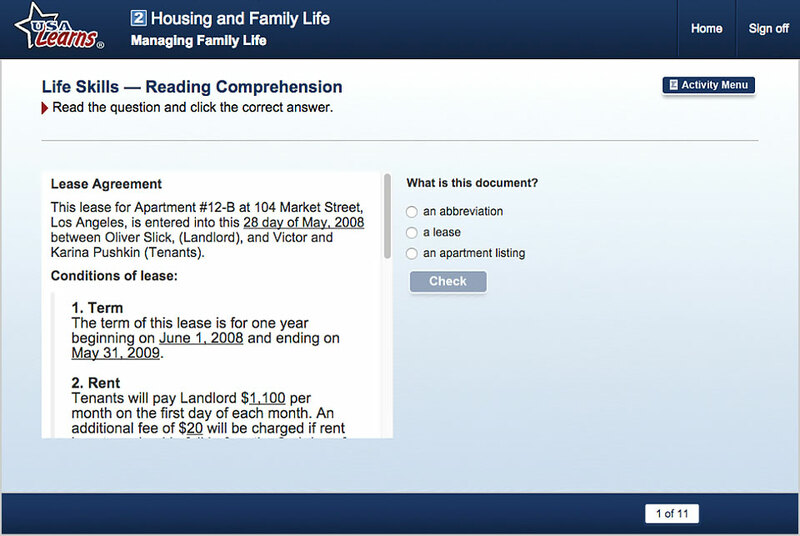 On video pages, click the Read Text button and read the video script while you watch and listen to the characters. Do that several times and listen as you read each word. Then click Hide Text. Now you can watch the video again and test your listening skills without the text. Reading is a very important language learning skill. It helps you improve all parts of the English language – vocabulary, spelling, grammar, and writing. Improve and use your reading skills and you will improve all your English skills. Reading improves writing; writing improves reading. Try to read and write in English every day for information and for fun. Write notes to family members, friends, and others who are learning English. If you have young children, read stories out loud to them; this will improve your reading, and will prepare your children to read too. If you are employed, write notes to others at work. Send them e-mails. If your cell phone has this feature, send them text messages. What do you find at work to read? For example, are there posters, notes or emails from coworkers or your supervisor, or from customers? Are there manuals, reference guides, bulletins, or written performance evaluations? Read as much as you can at work, even if you don’t understand all the words. When reading, for example in the sentences above, you may need to learn the meaning of a word or phrase such as: “text messages”, “posters,” “e-mails”, “co-workers,” “supervisor,” “customers,” “manuals,” “reference guides,” “bulletins,” or “performance evaluations”. The more words you understand, the better you will be able to read. A dictionary, a hard copy book or a free online dictionary such as www.thefreedictionary.com, can help you find the meanings of words that are new to you. Try to figure out the meaning of a new word from the words around it, from the context. Even if you are not always correct, it is good to practice thinking about what a new word might mean. For example, you may not know the word context, but maybe you figured out what it means from my description: “the meaning of a new word from the words around it”. Keep a list of new words, their definitions, and a sentence for each word that shows how to properly use it. You can keep this vocabulary list in a little notebook that you always have with you, or as a vocabulary list on your cell phone or computer. When writing, you may need to use a word you don’t know yet or are not sure of. Sometimes a computer or cell phone can help you find it. You can type in a description of the word in Google or in another search engine, and you may find the word you are looking for. Check its meaning with a dictionary if you are not sure. Play free word games such as Free Rice, Scrabble, or Words with Friends (available from the online Apple App store or from the Google store.) They will help you to build your vocabulary. Get a free email account, for example from google.com. Use it with your family, friends and for education and work-related purposes. Finally, if you need to improve your typing skills, check out this list of free, online typing practice sites. REGISTER NOW to learn English free with USA Learns!